A friend in Israel wrote to tell me she’d recently been experiencing vertigo attacks. They originate in the inner ear and can take several weeks to resolve. She was curious about my interpretation of the effect it has had on her swimming: I couldn’t swim for a few days and when I got back to the pool, things felt very unnatural. These included the position of my head and arms, an exaggerated feeling of acceleration and deceleration within each stroke, and feeling I must hold my head stiffly to control dizziness. Here’s my advice: I’m not that familiar with the causes and effects of vertigo attacks but I do have some thoughts about the disorienting sensations you’re experiencing while swimming. I’ve learned that nearly every swim-related problem presents an opportunity: In solving the problem, you discover something that can make your swimming much better. I think this can be so in your case. It seems unlikely that the things you perceive to be different about your strokes really are different. So it’s apparent that the main effect of vertigo on your swimming is in altering your perceptions about body position, timing, rate of movement. Where’s the opportunity in this? Because we can’t watch ourselves swim, we depend heavily on self-sensing to improve form. The water is an intensely sensory environment. We feel it flowing over every millimeter of skin, supporting us (or not), resisting us, and swirling away when we try to push on it. Since changed perception is making it difficult to think of anything else, go with it. Until this passes, swim in ways designed to highlight perception even more. This awareness exercise may give you a sense of what I mean: Place a raisin in your mouth – only one. Take a full minute to eat it. Compare your awareness of the texture and taste of this one raisin to what it is when you gulp a handful of them. For the next couple of weeks, savor every stroke you take like that raisin. 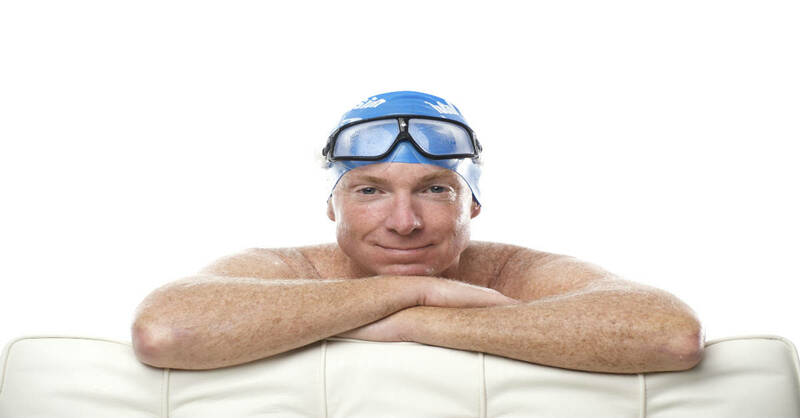 Your only goal is to increase awareness of the most fundamental aspects of your swimming. Start with Balance: Do you feel the water cushioning your head, your extending arms, your torso and lower body? How stable do you feel? Do you feel your arms or legs moving in ways you don’t intend and don’t really control? Can you tell why they do? Mix TI balance drills – Superman Glide and Skate – with short segments of swimming where you focus only on how your sensations of ‘Weightlessness’ and Stability compare when drilling, and when swimming. Then to Streamlining: How long, sleek and aligned do you feel? How much do you move water around vs move through water. Again, mix TI drills – Skate and SpearSwitch – with short segments of whole-stroke and compare the sensations. In everything you do, make time or distance secondary. Don’t count laps or repeats. Ignore the clock. As you eliminate those ‘distractions’ you’ll become aware of sensations you’ve overlooked before. The vertigo will pass, but you’ll be left with a level of awareness and discernment about your stroke that will be invaluable – both in the satisfaction of possessing it, and in the improvement it will produce. Thanks again ! Very helpful and encouraging. Accurate analysis of rather bizarre sensations. Great advice. Too often we get so focused on how long/how many repetitions we do that we stop noticing how we make them. About six years ago I suffered from Vestibular Neuronitis, a viral infection that affects the inner ear and also the optic nerve. During an attack the affected eye moves rapidly from side to side if you have Vestibular Neuronitis (Nystagmus) which is the cause of the dizziness of this condition. A special maneuver, the Epley Maneuver, carried out by a specialist may confirm the condition. It is a most debilitating condition and, whilst doctors told me it may take about three months for it to go away, it took close to two years before I felt almost 100% again and close to three years before I was completely free of occasional minor dizzy spells. I saw a physiotherapist who specializes in balance conditions and was given specific eye exercises to do and I did them diligently every day several times. I stopped swimming as a precaution to prevent inner ear infections at all cost, also worried that I may get dizzy in the water turning the head from side to side. Keeping active (on land) where you need to use your eyes and balance in a safe environment is also a great help as this helps co-ordination. I would recommend seeing an ENT specialist in order to diagnose the condition you may have, to find the best path to recovery and to exclude any other causes. My ear was stopping up more than usual. Flying, allergies, and swimming were not helping. Googled it and a device called the earpopper.com showed up. I ordered it (you need a prescription) and it seems to be working. I use it almost everyday. Thanks for your concern, but not to worry. She IS a doctor.